David Rattray with the Robert Dunsire violin. Pic credit: WALTER NEILSON. A violin presented to a war hero in 1915 has made a remarkable journey home and is now on display at Kirkcaldy Galleries. The instrument came into the hands of the Lang Toun’s only professional violin-maker earlier this year, but luthier David Rattray had no idea how important it was . The Robert Dunsire violin on display at Kirkcaldy Galleries. He only knew that the instrument had originally been made in Kirkcaldy. After doing some research, Mr Rattray was amazed to discover that the violin actually belonged to the World War Onel hero, Private Robert Dunsire VC. Buckhaven-born Robert was awarded the Victoria Cross in 1915 after he left the safety of the trenches to rescue two comrades stranded in no man’s land during the Battle of Loos in September 1915. 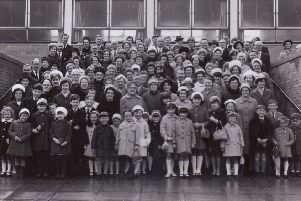 Following his award, he was given two weeks’ leave and, on returning to Fife, he received a hero’s welcome at numerous celebrations. Whilst at home he mentioned, in a newspaper interview, that his beloved violin had been lost in trenches. After reading this, Peter Berry, a local joiner and luthier, presented Robert with this violin. In recent times, the instrument found its way into an antique shop where it was bought by respected violinist Tony Moffat, who then passed it on to Mr Rattray. He has since restored it and loaned it to Kirkcaldy Galleries for its current exhibition to mark the centenary of the Armistice. Mr Rattray had always planned on gifting it to Kirkcaldy Galleries so people could see it on display. He added: “I am so glad the public are are able to view this special instrument, particularly given the centenary of the Armistice. “ The violin has now been fully restored to playing condition, it had a fine sweet tone, so I’m also delighted it will be played at a couple of planned museum events – Vince Gray, leader of the Kirkcaldy Orchestral Society, has agreed to give a couple of informal recitals, featuring light classical pieces WWI related.